For years, everyone said to smoke a brisket fat side up. The theory said that the melting of the fat cap on the brisket would baste the meat in moisture and keep it from drying out. Now, there are lots of people winning big prize money in major barbecue competitions with the fat side down, and there are still others who are flipping their briskets every two hours. So what's the deal? Should we all turn our briskets over and go fat side down? Pro: It makes perfect sense. Put a 14-pound brisket in the smoker and pull out 11 pounds of meat (or thereabouts) 15 to 20 hours later. There is also a drip pan full of melted beef fat. If the brisket is placed fat side up, all this melting fat will pour over and through the brisket, keeping it moist. Con: Meat is not a sponge. Yes, it will absorb moisture (think brining) in small amounts as long as the circumstances are right, like a low temperature, salt content, and the right PH. The fat from the melting cap is going to pour around the meat and drip off the bottom. This action will wash off much of your spice rub. Pro: Heat rising over the brisket is the primary source of drying. By using the fat cap of the brisket as a shield between the intense heat of the fire and the delicate meat, you'll end up with a more tender brisket with a lot less surface drying. Con: There are two kinds of heat inside your smoker. There is the heated air (hopefully smoky) convecting around the inside of the smoker and doing the majority of the cooking. Then there is the radiant heat; radiant heat travels in a straight line and heats anything it runs into. Radiant heat will dry out meat quickly. Most smokers do not allow radiant heat to hit the brisket. The flow of air (convection) around the brisket draws off a lot of moisture, but smokers work by getting the air to flow around the brisket, and if you measure the air temperature around the brisket, you will find it very consistent so as hot on the top as on the bottom. Pro: By flipping the brisket over every few hours (typically two) and basting, you get the best of both worlds. The added bonus is that the side turned away from the heat will have a chance to rest and reabsorb some moisture. One side won't dry out, and the brisket will get basted by the melting fat cap for half the total cooking time. Con: Every time you flip your brisket over, you are dropping a lot of pooled moisture. You are also exerting pressure on the meat, forcing moisture out. This is why you need to baste at every turn, to compensate for the lost moisture. If you didn't flip the brisket but did baste it, you would get a much more moist brisket. So what's the truth? If you have cooked a few briskets, you will notice that the part of the brisket closest to the heat gets dryer. Of course, not all smokers work the same way. If your heat is directly beneath the brisket, then turning the fat down will help protect the meat from the heat. 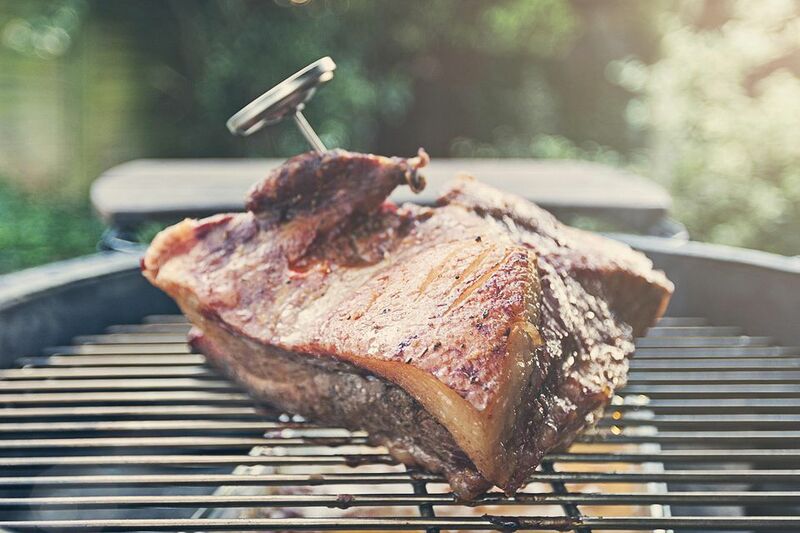 Melting fat, however, does add moisture to the meat, so if you have an offset smoker, you might as well keep the fat up, but you need to rotate the brisket so that one side isn't closest to the fire the whole time. Flipping the brisket does even out the exposure of the meat to heat. Airflow inside any smoker is uneven and letting the brisket sit there in one position the whole time will cause part of it to dry out simply because of this unevenness. Ideally, flip and rotate your brisket at least once during the cooking. If you need the fat to shield the meat from the fire, then leave it fat side down for the majority of the time. Start with a well-marbled brisket with a thin layer of fat (cap). Keep fat on the brisket. Keep the fat between the meat and the fire as much as you can. Baste frequently with a good brisket mop. Flip and rotate your brisket at least once during the smoking to even out the exposure to heat. Keep the heat in the smoker low (under 250 F). Cover the brisket with foil and let it rest for at least 30 minutes before carving.